I love Sharon, and it does bring us up short when our contemporaries blink out this way. Condolences to us all. Hello C.C. — you put it very well. Nice post. How can we not let musings of the final curtain enter from time to time? 70 was a celebration for me. We went out to listen to jazz wit some young friends and ended up with tequila shots (Patron Silver, mind you) at 2 a.m. 71 was a “oh. I’m really in my 70s” blow and I went to the farm in an “I ‘vant to be alone mood” and ended up having to pump water out of the basement. (You can search for that adventure on the blog under I’m not as old as I thought I was). This year’s, I don’t remember so that either means it was fine or uneventful or I’m creeping into senility. Maybe we’re aging into fine wine. Loved the video. We saw Ko Ko Taylor a year or so before she died. When I heard the opening chords of “You Can Leave Your Hat On” I, along with audience, roared. Hi Janet. Your comments here are some of the best that anyone ever has written on my blog. Thanks for the video….she is great. I never heard of her before. 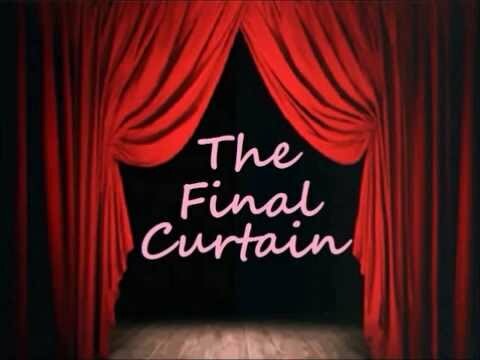 I was sad reading about the final curtain since l have passed the 70 mark. We’re getting up there. Unfortunately. What a wonderful woman to pour out her heart in song like this. It’s often the very bright lights that don’t hang around to dim slowly. I’ve lost quite a few close friends over these last years. Been going through the loops every time. If there’s something good to be said, while the curtain re-opens every day, I appreciate the marvel of being present to myself and others more, and the small wonders each day brings. Hi. You have a clear and strong perspective on life. That’s a very good thing. Great story. Rock on, Neil. I like the quotes a lot. There’s plenty of wisdom within them. I just wake up each morning, put one foot in front of the other all day, and don’t give one thought to ‘end of life’ issues, or death, if you prefer to put it more directly. Seems such a waste of energy to worry about it! Right, I agree. Once in a while, though, I think about these things. And in this most recent instance it inspired the above story. That is probably one of the best videos I’ve ever seen. Thanks for that . What a woman. She’s my hero!! I’m glad I got to see her in person. She was a great talent. I was reading along, chuckling and identifying, when you got to the real reason you were writing the post, Sharon Jones. I was totally unfamiliar with her and have now watched the video 3 times. She is everything you described, and anybody would have to love Thomas. She was great. The world lost a tremendous talent when she passed away. I was off chasing trout with a fly rod in rural Wisconson back in May when Tuffy P texted me to say she had tickets for Sharon Jones and the Dap Kings. The show was later in the summer. Her cancer was back by then, but when she got onstage she was transformed and the whole show was a fantastic experience. What a remarkable person and performer. Hello, Eugene. Thanks for visiting. I read a bunch of articles before starting to write this piece. And I came across other people saying what you just said — i.e. despite the cancer, she performed marvelously on stage. 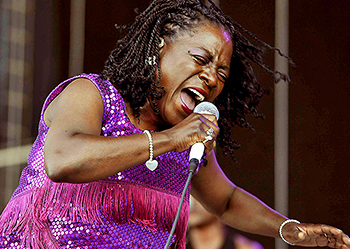 I only became familiar with Sharon Jones a couple of years ago, and it’s been a great couple of years… so sad. I really loved the interview she had with Terry Gross earlier this year. I could listen to her talk for days. Hi. Thanks a lot for stopping by. I’m going to try and find that interview online. Hopefully it has been archived on a public radio website. Love your writing style Neil. Particularly like the phrase ‘my clumsy dance through life’! Sharon seems to have been a real force of nature – we need people like her to keep away the dark. Hi, Andrew. I totally agree with what you say about Sharon. Hi. I’ve been very negligent in my book reading. But I’ll add the book you mention to my miles-long TBR list. A very moving and resonant reverie. What might have been a hopeless downer instead under your influence and reflections, Neil, became a lovely hymn to life! Many thanks. I appreciate your thoughts very much. so many voices silenced this year…wonderful tribute to a lovely person who gave a bang-up show! Hi. Yes, Sharon Jones was really something. As always, Muriel, I really enjoy and appreciate your thoughts.